Microsoft just announced in its Ignite 2015 conference in Chicago that Windows 10 is set to be "the last version of Windows." "Right now [we are] releasing Windows 10, and because Windows 10 is the last version of Windows, [we are] all still working on Windows 10," said Microsoft's developer evangelist Jerry Nixon while speaking at the conference this week. What exactly does it mean? Will Microsoft not launch Windows 11 next? Is Windows 10 actually the end of Microsoft’s Windows operating system? These are some questions that were ongoing in the mind of the audience when Nixon gave this statement during his speech. The reaction from Microsoft was really alarming though you do not have to panic, as Windows OS is not dying. For the moment, Microsoft will stick with Windows 10 and focus on smaller and faster updates to its Windows 10 platform, instead of launching new stand-alone versions of the operating system every few years. This Microsoft's new approach is something similar to Apple's OS X, the Mac operating system that gets smaller updates on a yearly basis and has been known as OS X for over 15 years. Every new release of OS X gets a unique name with some major updates, but Apple didn't change the name of its OS. Oh! Give me a break. 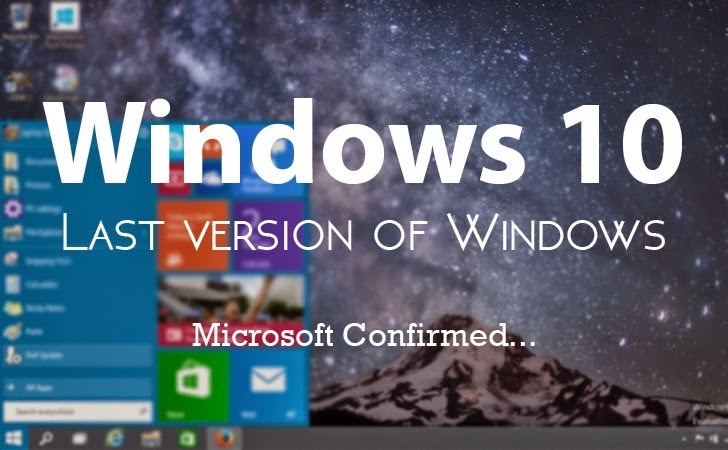 If I take you back when it was decided by Microsoft that its next Windows version will be Windows 10 and not Windows 9. This could be a reason that Microsoft wants to stick with Windows 10 brand name for the near future. Speaking to The Verge, the company confirmed plans to improve Windows 10 through regular updates though Microsoft has no plan to roll out a new version of Windows at some point in the future. The future, the report notes, is "Windows as a service," although the company has yet not clearly explain it. "Recent comments at Ignite about Windows 10 are reflective of the way Windows will be delivered as a service bringing new innovations and updates in an ongoing manner, with continuous value for our consumer and business customers," Microsoft spokesperson said in a statement. "We aren't speaking to future branding at this time," the spokesperson added, however "customers can be confident Windows 10 will remain up-to-date and power a variety of devices from PCs to phones to Surface Hub to HoloLens and Xbox. We look forward to a long future of Windows innovations." There is no doubt that Microsoft have spend and have to spend an enormous amount of money in marketing to convince users that this new version is what they need and that Windows 10 is better than anything that had come to them before. ...Windows 10 could mark an entire new chapter for Microsoft where Windows is more of a service, however, the company still needs to really launch the Windows 10 operating system first.